I've long been in love with the Silver Women's Glitters. They're glamorous and sophisticated but still casual and cool, thanks to the flat silhouette and cushy outsole. I ordered mine true to size, and while they were a bit tight the first time I tried to get them on, they quickly molded to my feet and became THE MOST COMFORTABLE SHOES I OWN. 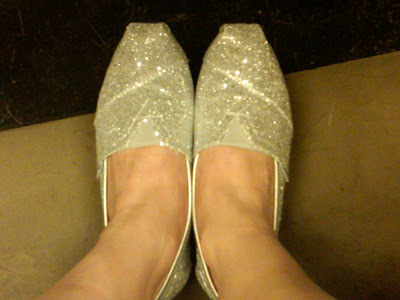 Plus, they're glittery silver! I've been stopped on the street multiple times in the past week by people telling me how much they love my shoes. I seriously feel like Dorothy from The Wizard of Oz in these. (Because, unlike the movie made her shoes out to be, in the book they're actually silver.) 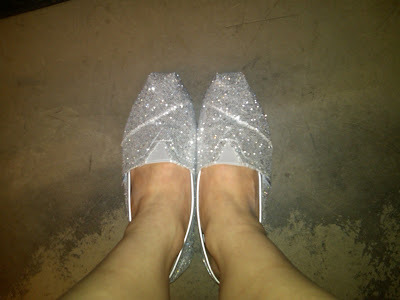 Purchase your own pair of TOMS Silver Women's Glitters for $54 at toms.com. Love them!!! I have actually been trying to decide on which color Tom's I want to get. Between the brownish pinstripe and the black glitters! Haven't been able to see the glitters in person, so I have been hesitant to order them.. So, the glitter doesn't look cheap at all? They look adorable on you!